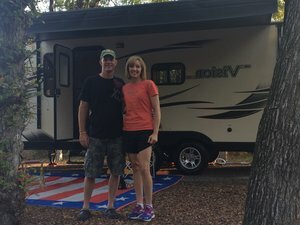 Welcome to the fourth episode of “The RVing Life Show”, where I interview Amy and Greg Wallace of Arlington, Texas. Amy grew up being in the outdoors, but didn’t camp. Greg grew up camping, fishing and RVing with his grandparents. They’ve been married 22 years, and have experience with owning five different RV types. On the show they share with us their journey of buying their newest RV. Learn Amy and Greg’s insights on finding the ‘silver lining’ when making the decision together. They reveal how their buying questions have evolved over owning many different RVs. Tips for making absolutely sure you get the right RV for your family. Kevin: Well, Greg and Amy Wallace, welcome to the show today. So glad to have you guys on. And you’re coming to us from whereabouts in Texas today? Greg: We’re in Arlington, Texas. We’re actually sitting in our RV. Kevin: Nice, alright, so Arlington for those of us that … I know where it is, but for those that may not know exactly where Arlington is, you guys aren’t actually out in the boondocks, right? Greg: Yeah, we’re in the middle of Dallas and Fort Worth where the new Cowboy Stadium is. Kevin: Awesome. So that shows that people don’t have to live out in the boondocks to have an RV, right? You guys are living proof of that. Kevin: Alright, cool. So just as we get started here today you guys have quite an interesting story. I know the pre-show we mentioned some things, but also here as well. There’s just … you’ve had experience with a number of different RVing experiences and throughout your years as separate, as growing up and together. Why don’t you guys just share with us a little bit about kind of how you got started on RVing, what’s exciting about it, and just individually each of your story a little bit? That’d be great. Greg: Okay. I grew up RVing, my grandparents both had RVs, they had traveled trailers and motor homes and all those types of things, and so I grew up doing that, going to the lake, actually going out of state. And so I was really interested in it. When we got married we had a little tent camping, and we decided we would like to give it a try. And trying to recreate it without actually buying an RV we had a converted cargo trailer, we had a camper we got off a deer lease that we converted, and then we had a fifth wheel travel trailer, you name it, we’ve about done it. But really just have enjoyed it and started out trying to kind of fake it and now we’re actually, did the research, bought a real one. Kevin: Nice. So Amy, what about you? Is RVing new for you or you’ve got some experience? Amy: Yes, when I met Greg his grandparents went RVing, and then we went with them a few times in their fifth wheel, and then we started decided that we wanted to do something like he said, and then we started. So I didn’t do it growing up. I didn’t do a growing up. It was all because of my husband and his grandparents. Kevin: Nice. You guys have children, right? They’re not little anymore, but you have children you take what you camping, they enjoy it as well I’m assuming. Amy: When they were younger. We started one day … we were talking about that either two and four, three and five, something like that is when we started going with like couples our age, a church group we started with. And then they kind of grown through all the different RVs we’ve had. And then we bought a trailer, and then they outgrew the bunks. So then we took a break and started renting a little bit, and then we decided to get this one. So they do go with us some now, not as much. We go to their events in this now is what we can get going on. Kevin: Alright, nice, very good. So you guys have had the experience then of buying and owning pre-owned RVs, and the one that you’re in now is a new RV, right? Kevin: Well, kind of go and walk us through that process that you guys went through of looking for the new RV. Like what was it like for you? What were some of the challenges you kind of went through? Greg: I think our big thing is that we’re sitting behind our house right now, and so in order to do that we have to have a pretty specific size RV. And so we want a 30-foot airstream, low to the ground, long, luxurious. But we need a 20-foot travel trailer that’s high enough off the ground to make it up the driveway. And so I have walked … I know exactly how much 25 feet is if I step it off, and I’ve walked past hundreds of RVs to say, “Okay, before we go inside here we’ll just think fit up the driveway around the corner behind the house.” Because for us it’s easier to take it if it’s right here at the house, it’s easier for me to fiddle with it if it’s right behind the house, and it just keeps better. We have had one stored outside, and it fought with mice and this, that, and the other. And so having it here, it’s plugged in, it’s just that it’s ready to go at all time. But in order to do that we walked around the outside of a whole bunch of them. And then ultimately … the one we had back a few years ago that the kids outgrew didn’t have a slide. It was a little bunkhouse, it was a nice little trailer, but the kids were too long for the bunks, and we had to turn sideways to pass each other. So we wanted to make kind of next step, be the one that we’re going to have for years and years and it be our empty nester trailer now that the kids don’t want to go as much. So we wanted a slide, we wanted room, we wanted a sofa, and we’ve spent a lot of time … or at least I spent a lot of time. I spent a lot of time researching, we went to shows, we walk around a lot, and really just kind of narrowed it down to here’s one that’s not going to step off on the outside that fits, and here’s one that she can come to the inside, sit down and it fits. Kevin: Nice. It’s really interesting, all the people that we talked to RV shows and other RV owners that we meet at the campgrounds ourselves, people buy certain RVs for all different kinds of reasons, right? I mean some is just purely lifestyle let’s say a toy hauler, right? They carry their motorcycles around in it, whatever. Some of those get really big. And then there’s the motor home buyers and the fifth wheel full timers and everybody in between. And then you guys have purchased this RV, very specific things you needed and wanted on it and a certain size primarily so that you can keep it at your house, right? 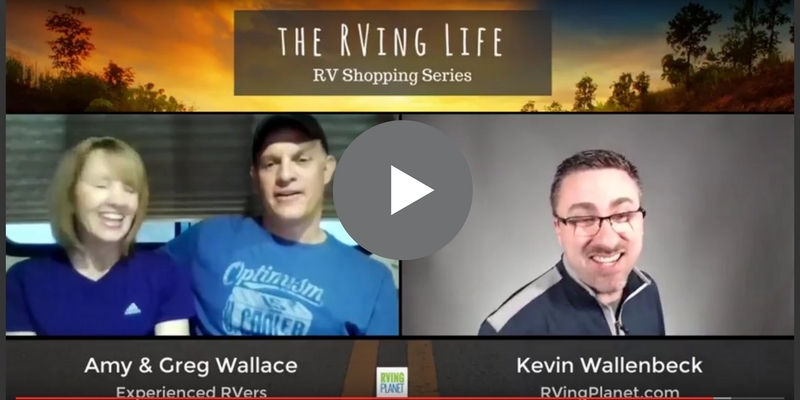 Kevin: And it just amazes me how many different reasons people buy RVs. I mean, I just don’t think about. I don’t think the average shopper when they first start looking … When you first started looking what were some of the, I don’t want to say challenges, you mentioned size, did for sure right away? How long did it take you guys when you started thinking about buying a new one when you said, “We’re going to buy one,” to when you started really making that decision? What was that time for you like and how did you through that process? Amy: Well, to kind of backtrack, since we’ve owned so many, and we’ve kind of own a variety, we started with a cargo truck just like we said, and it was right for the kids were small. He kind of was building it into like a mini trailer and it worked with our lifestyle, going with our church friends, they were in a YMCA group with boys, and it worked really well. But then you kind of outgrow it, and then you move to the next step which is a truck camper that was just, “Let’s try something different.” And the kids love that. That was a blast. They have some great stories from that. But then they kind of outgrew that, it gets kind of stinky when you close all the doors, it’s a small space, so we outgrew that. And then actually his grandparents gave us their fifth wheel because they weren’t able to use it anymore. They were in their 90s actually. They camp until 1992, we took them on their last camping trips. So that was really cool. And they gave us that, so we use that. And it was wonderful but it was so big and we had to store it like he said out in the country, so it was harder to say, “Let’s go this weekend,” because we had to go pick it up 45 minutes away, bring it back. And so then we changed, and we’re starting to get a little older, we’re like, “We need something smaller. We need to park it in our backyard,” right? And then so we got that other one we have said, a trailer. Park it in the backyard because then we could go last minute, we could go at 6 or 7 on a Friday night versus having to drive all the way down 45 minutes away and drive back. And then we took a break from it because our kids, we weren’t going as much, we didn’t have the time, just working through age. And then we started shopping and renting. So we started renting, and that worked really well. I think the guy that spoke to you last week was talking about it. Amy: And we rented though from like a dealership and then from a rental dealership type. And we just tried them. What do we want that we could keep because we hadn’t been keeping any of them very long. So we really did decide we wanted to research this one and what would work for our next five to ten years for us. Of course we’d love to keep the 20 but we’ve seen our life just changes. We had little kids, we just carry a bunch of kids, and then we went with just, our kids outgrew it, all that kind of stuff. So then we started researching it, my husband loves researching stuff. So now we’ll go to him. Amy: We did a larger travel trailer. Greg: Yeah, we did a couple of larger travel trailers. So we narrowed it down to we think we need it to be a travel trailer, because the one time we rented a pop up, I was sold but it rained and that ruined that. Amy: The family did not love the pop up. But we started … we never started in a pop up. So it was kind of hard for us. But that was not a great Thanksgiving for our family. Greg: I had fun, but … But once we’ve kind of narrowed it down then it’s a matter of just doing the research, and we’ve been to a couple RV shows and we actually had started out looking even smaller than we’re in now. Greg: And we got down to really, really small and sat in that for … sat in a few of those for a while and just said, “Okay, can we do this?” And ultimately decided, “No, we needed to be probably just as big as we can get in the backyard so we don’t outgrow it and just have a couple of specific things.” And so the one we found had the right size. And that’s where I got into the number, so I know how big the refrigerator needs to be, I know how big the AC needs to be, I knew that we needed a walk around queen bed. And so that narrows that in a 20, we’re a 20-foot box I think or 21-foot box. So a walk around queen bed narrows the field very quickly. And so we narrowed it down, we found a handful to go look at, and the one we got, the one we’re sitting right now has got a slide and it’s actually got a Murphy bed. So we’ve got a sofa in the front of the trailer that folds down and a queen bed drops down on top of it, and it’s a walk around queen bed. Amy: But we never thought we wanted a Murphy bed. We had some friends who had one and we’re like, “Oh, you have to put your bed up. When I go camping I’m like not making my bed. I am that girl who doesn’t make their bed.” So we weren’t sure we like that, like we’d have to put up our bed. And so I want to go to camping and relax. I don’t want to have to worry about all the stuff I worry about at home. And then he started saying he wanted a sofa. I’d like something that we could sit. And so it just kind of worked out like we ended up because it took us two years? I don’t know. Two years. Greg: Yeah, probably two years. Amy: Two years of kind of researching it and thinking about what we want when we finally get another one and it came that a sofa was important, a queen bed of course, I wanted a slide out, I didn’t want to have to move, move every time somebody walked by. Amy: Yeah, so and of course we wanted full bath because I enjoy full hookups more than the other kind of camping. So that’s me. I now love the outdoors; I love the full hookups, so I like to run my shower. And so then it ended up coming out to, “Well, where are we going to take it? What are we going to do?” Our kids come sometimes now, sometimes they don’t. They go to the grandparents’ house or stay at friends’ houses. So it was like we don’t need it too big so that if it’s just two of us. But then when it’s all four of us then we need enough room for everybody to sleep. So we even took our cut, we were like, “Okay, we only really need sleeping for three, maybe four.” Because the kids still tent some too. So we just thought of every scenario and that’s kind of where we came from. I don’t know if it’s really complete. Kevin: That’s very cool. So Greg, when you’re going through that process of all the numbers, right, that numbers game, what were some of the challenges that you found along the way over that two-year period? How’d you go about researching it? What are some of the challenges you had trying to find those specific things? Like how did you end up finding it and narrowing it down? 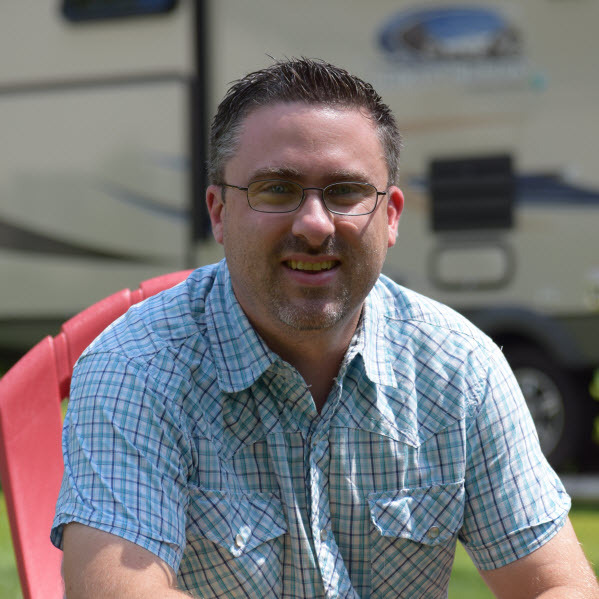 Greg: Just knowing that we needed a few key things, keying in on those things, looking at the website, looking at the internet, and then going to RV shows. And if you know I need a full bath and a queen bed that faces the right direction, and I know that’s a little sticker on the number by the door and they used to probably say less than 25. We just don’t walk into ones or if you know, if it says more than 25 don’t fall in love, you can’t have that one. Amy: Yes. That was the process. Greg: And so you start out with it needs to be a 22 to 23 and you peek in or you go on the internet and you say, “Okay, I need to look at 22 to 23. I need to look at the layout. I need to see if it has a dry bath and a queen bed.” And so you can use the tools at your disposal online where you don’t even have to step on a dealer’s lot until you get it and narrowed it down. And so I didn’t walk around a lot. I didn’t walk around a lot of dealer’s lots that specialized in motor homes or fifth wheels or longer travel trailers. Amy: He did in the beginning let’s say. He did in the beginning. Greg: Well, yeah, because we rented about everything. Amy: And they thought we looked funny. Amy: Well, actually the last place is a dealership … no, we took it to the RV show, didn’t we take the bed in there? Amy: Those are few places then we went in, because that one other place we didn’t buy that. So we started going to dealerships and we are carrying the cot in there. And sometimes the salesman wouldn’t come out, so nobody would see us. Well, we had a few and this last one we bought we had it sitting in there and the guy looked at us like we’re crazy. But it’s like we knew what we were looking for, we knew could you put the cot in there, you’d have the U-shaped dinette and be able to get to the bathroom, because we don’t want to crawl over anybody. So there were just things that we’ve learned owning them over the years that what we did want and we didn’t want. And then we have a bunch of friends that we go camping with. And so we listen to what they said they liked, they didn’t like over the years, and what worked for them. But they were all kind of different; we all have our different likes. But you’d listen to all that and then right now we feel like this was the package that is totally working for us more than anything we’ve ever want. Kevin: That’s awesome. You got it out. You’ve already had it, I mean, you guys live in Texas and it’s new. And I live in Michigan it’s like still high 30s here, we’re not taking the RV out to a local park anytime in the next probably month yet. Maybe months, maybe. But you guys you’ve already had years out. Greg: Oh, yeah, we can winterize it, then winterize it fairly quickly. I know how to do that. And because it’s in the backyard when it’s not running, then when it gets cold and run the AC when it gets hot, when we’re a little bit, and we’ve had it out for spring break, we actually took it to a track meet and parked it in the back of the high school track meet, parked in the back of the parking lot and it was our tailgate. Yeah, that was our tailgate. Amy: And then a bike ride. And that was really neat, we’re like, “Okay, we can do this on some of them.” But of course then the weekend gets away and we can’t always, but we’ve taken it more because of the size and because it’s in our backyards than we did previous ones I should say. Kevin: That’s awesome, cool. Well we’re going to get finished up here. You guys have a wonderful story. I’m sure, maybe we’ll get to have you on here again in the future. But it’s really interesting. I think people are going to find a lot of value in what you guys have to bring to the table. One of things that I picked up on was you weren’t afraid to do due diligence and really make sure walking in, putting things down, laying on the bed, sitting on the couches, moving through … A lot of times people get and especially looking in new RVs they do get a little excited about the bigger, the better, more amenities. And they forget they’re actually going to have to live in this thing for … if you have a rainy weekend you’re inside for two or three days at a time. And so that’s something I picked up for you guys. So before we finish up and kind of give you guys the last word here. So what would you say shopping together, obviously you guys shop together for the RV, right? You have different … What was … Amy, what’s one thing that you could tell the audience? Yeah, so what’s one thing that you can tell the listeners, Amy, and then I’ll give Greg your chance too, what’s one thing you would tell them when shopping with your husband, what would you say? Shopping with my husband I have to make sure I do this. What would that be. Amy: I don’t know, because the way we really approached it, I mean he researched it. I told him what I wanted. He probably went to more dealerships without his wife. We had it, that’s just kind of how we shopped together. And these are the ones and then it’d be like, “Okay, can you go on a Saturday and let’s go out and look at these dealerships and walk in these RVs.” And that’s how we worked at. I don’t know that kind of wasn’t your question, but I also want to say for us it’s about camping with our friends, camping with our family. That’s the reason we started doing it, because of his grandparents. And then we have a group of, it used to be like 10 or 12, some have downsized or gotten rid of them because the kids have gotten older. But like Thanksgiving we go with a bunch of families and we camp out. Now we’re starting to go to our kids track meets. And we’re talking about football games, just be in the parking lot just a way to be comfortable in between the times. So for us that’s the way we go versus long trips we don’t take as many long right now but we plan to when we have more time to do. Kevin: Yeah. Was there anything, Amy, you felt like you had to compromise on working together in the RV, to buy? Amy: No, because we work really well together. That one wasn’t hard for us. Amy: If he smiles I think he agrees with that. Greg: Yeah, I would say if I would give someone advice just take your time, and don’t look at stuff, don’t look at stuff either you can’t afford, don’t look at stuff that doesn’t fit, because once again if you’re sitting in a 30-foot trailer and you can afford or you have room for a 25-foot trailer, take your time. So we narrowed it down and then once we narrowed it down we took time. So take time and sit in it. And I guess also if you’re in something and you’re thinking, “We’ll give the wet bath example.” So I’m trying to talk her into the wet baths. It’s highly efficient use of space. And she’s no, and so you got to say, “Okay, if she’s no, I want it, I guess everyone has that one card they can play.” And so she … that wasn’t hard and we’re not going to do that. My card was I don’t want something that I have to store somewhere else. And so know your parameters and then take your time and hang out and have fun with it. Because it is … all the exploration is a ton of fun. Amy: I didn’t try the wet bath though. I tried to get in and sit in them. So you kind of go backwards. If we would have started maybe there would be one thing, but we had already started in a grandparent’s fifth wheel. So we kind of backtrack a little but we always had a bathroom, we always kind of had a shower, so it just, yeah, so that’s how it worked out for us. Did you say it was good talking to me? Greg: It was fun, yeah. Kevin: Yeah, that’s awesome. No, I mean, I think you guys are a good example of working together, taking your time and trying to make the right decisions in buying an RV. So man, I really appreciate you guys so much coming on the show and sharing with all the other people out there. So to all our listeners out there just make sure at the bottom of the show here that you click on the link that says … you can submit a question at the very bottom the show if you’d like to do that and we’ll try to get your questions answered. But thanks again, Amy and Greg, so much for being in the show. Maybe we’ll get you out here sometime in the future. Amy grew up being in the outdoors, but didn’t camp. Greg grew up camping, fishing and RVing with his grandparents. They’ve been married 22 years, and have experience with owning five different RV types.